Have you seen this beast chewing on your citrus or related plants? We'd like to introduce you to the giant swallowtail caterpillar. Typically, giant swallowtail butterflies, which are large black and yellow butterflies, lay their eggs on citrus plants. They will also feed on other plants in the citrus family, such as choysia shrubs. 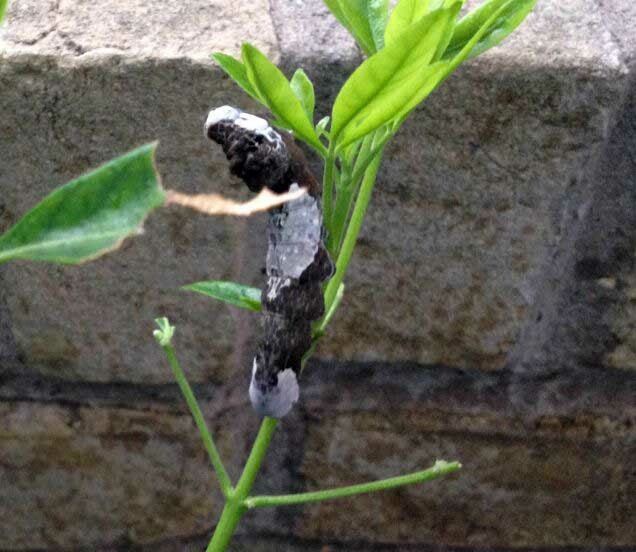 Agriculturally, giant swallowtail caterpillars can be a destructive pest. In the home garden, however, you may only encounter one or two caterpillars. So if you want to enjoy the giant swallowtail butterflies in your garden, let these critters munch for a bit. Soon, they'll pupate and stop feeding on your plants.